After living in this house for four years, we've gotten to the point where we have the major projects completed and we're starting to look around for smaller upgrades, little improvements we can make to our existing stuff that ups our game a little bit. Case in point: the media cabinet in our den. It wasn't anything special; it was just a damaged cabinet we got for a great price in the "as is" section at Ikea that I'd gotten really good at ignoring. 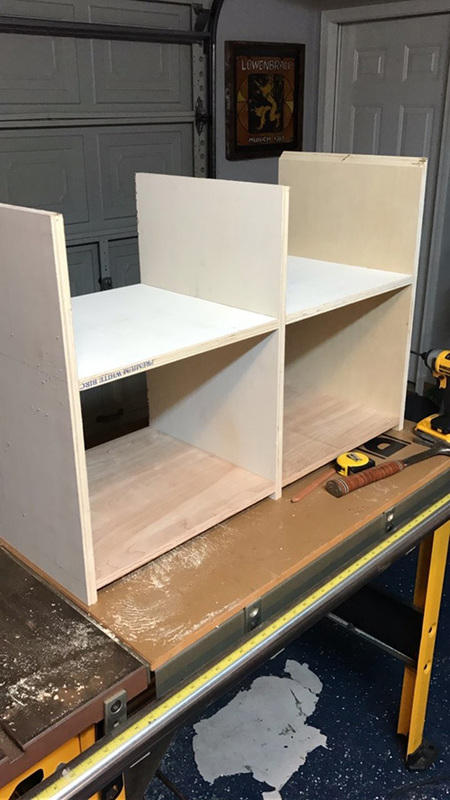 It wasn't until I was watching a recent episode of The Weekender, an online home improvement video series from Lowe's, that it even occurred to me that we could just build our own media cabinet and make something so much better than what we already had. 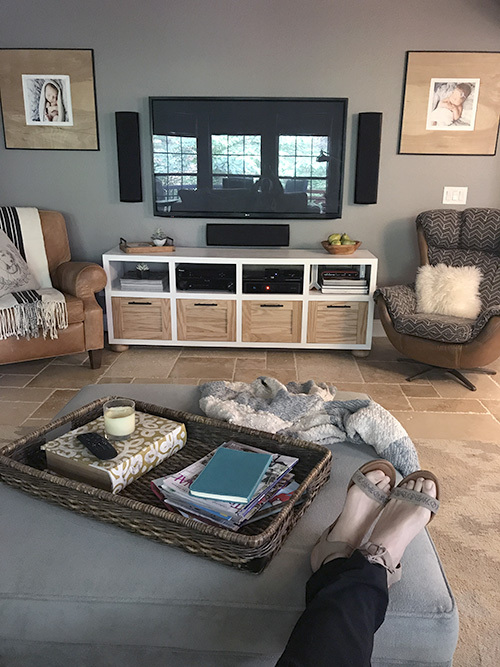 In episode 9 of season 2, they designed a sleek media storage cabinet that spanned the entire length of one wall in the client's living room, providing tons of functional storage below an equally stylish mantel that ran the full length of the wall. 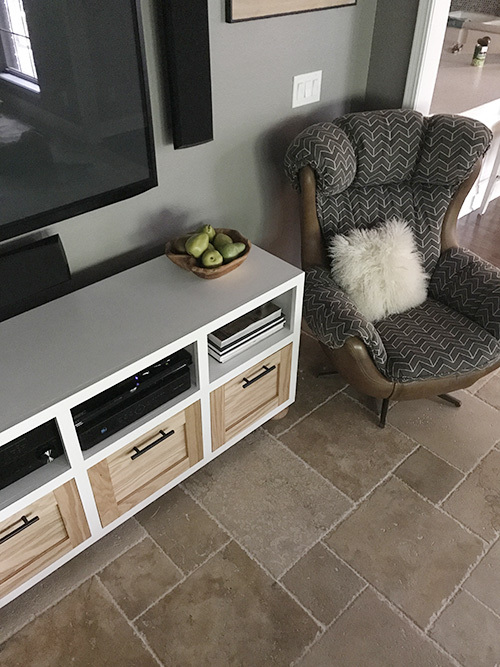 It was a different style than we needed for our den, which is much more traditional in its architectural details, but the tutorial gave us the basics we needed to understand the process and customize it to our own home. The husband outdid himself on this media cabinet, am I right? It's even better than I envisioned when I sketched it out. Ahh, so pretty! But before I share a million photos of our new cabinet, let me start at the beginning. 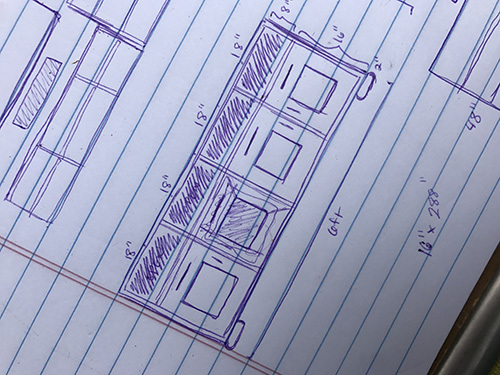 When you're building a custom piece of furniture and can design anything you want, it's overwhelming. I started sketching out concepts, and I was all over the place. I didn't like any of my ideas and that was frustrating. What finally helped me land on the winning design was picking out something we already had to inspire me -- in this case, I decided that I would use the custom DIY photo frames we made for the den to provide direction for the media cabinet. I loved the mix of the raw wood with the sleek black frames, and the touch of white really brightened up the frames against our dark grey walls. 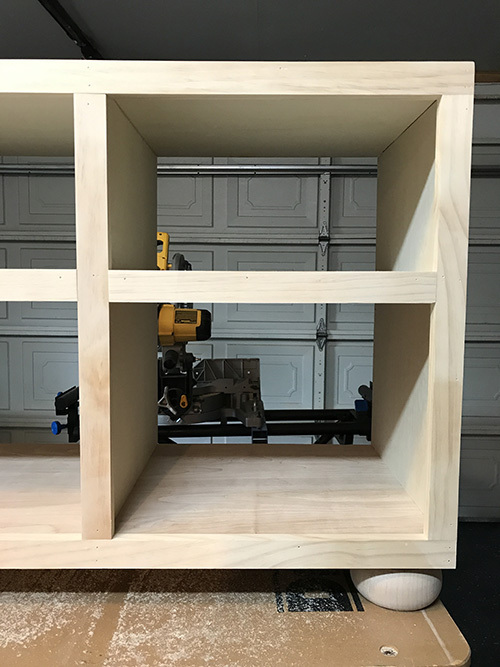 This cabinet was designed to be much bigger than our previous cabinet, scaled to match the width of both the TV and the speakers on the side so that it would be visually balanced. 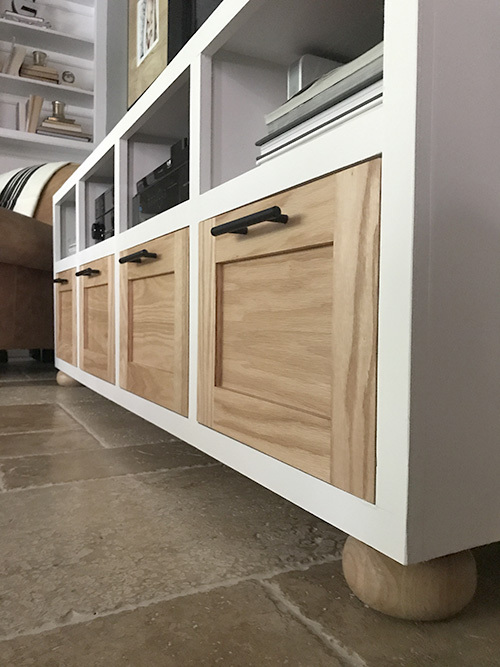 The overall design is modern but not too modern because we softened the hard edges by adding the shaker cabinet doors and the cutest chubby bun feet. (Picture me holding these bun feet up in our local Lowe's and embarrassing my husband by singing "I like big buns and I cannot lie." It was magical.) 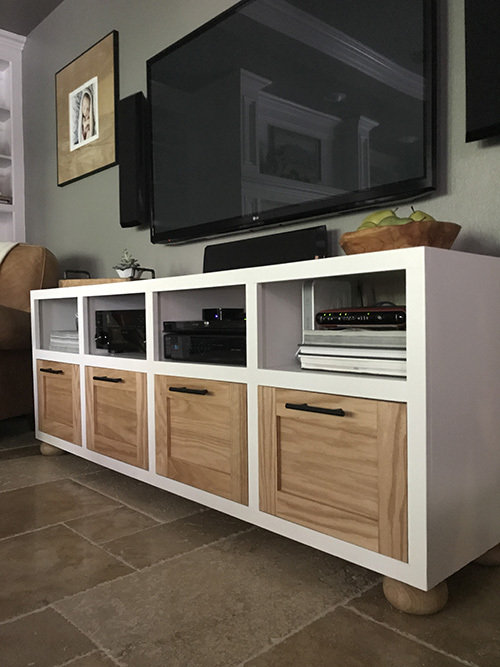 I decided to go for the white/natural paint scheme because our entire den has a nice mix of white and natural wood textures, so I thought it would be right at home. 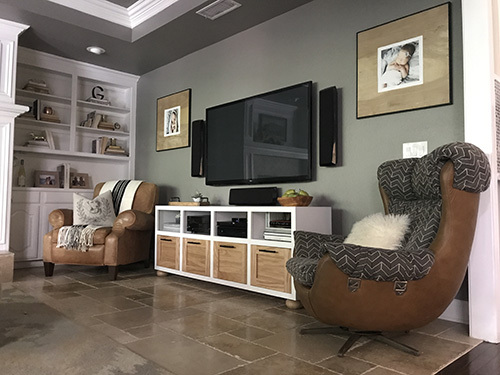 The matte black pulls added the perfect tie-in to the black photo frames, TV and AV equipment. Once I finalized my design, I handed the baton to the husband and told him to make me a gorgeous cabinet. And because we have twin toddlers and busy work schedules right now, he did his best to squeeze in carpentry time on weekends, during naps and late at night. We put some considerable thought into what wood to purchase. I had no idea there were so many different types of plywood. It's mind boggling when you're standing in that aisle trying to figure out what to buy. 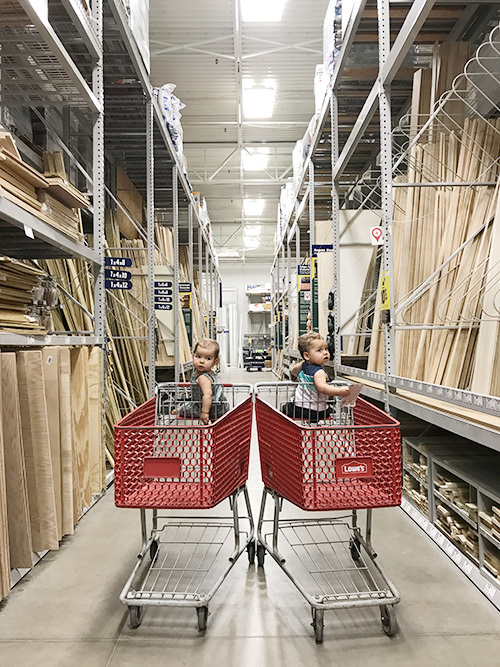 (It makes me grouchy, but my husband thinks the lumber aisle is just delightful.) 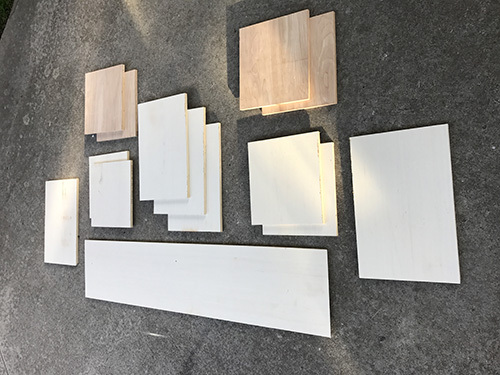 This is a helpful resource for how to choose the right plywood for your project. I didn't really care about the wood that would be painted white so I let Scott figure that out, but I did pick the wood for the doors because I wanted the right tone for the wood grain to shine through. The box is built with one 4x8 sheet 3/4 inch maple plywood along with one 2x4 sheet of oak plywood. 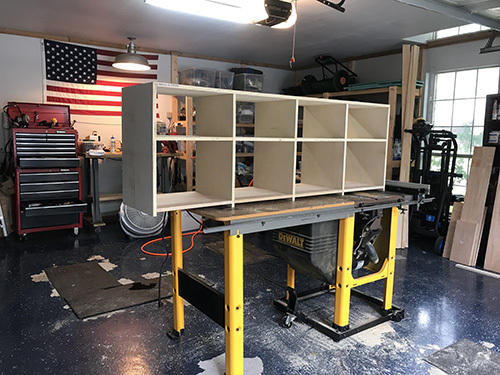 He used the maple for the outside and the top shelves (the part that would eventually be painted white) because one side was already primed to help with the painting process. He used the oak plywood for the bottom shelves inside the cabinet doors. 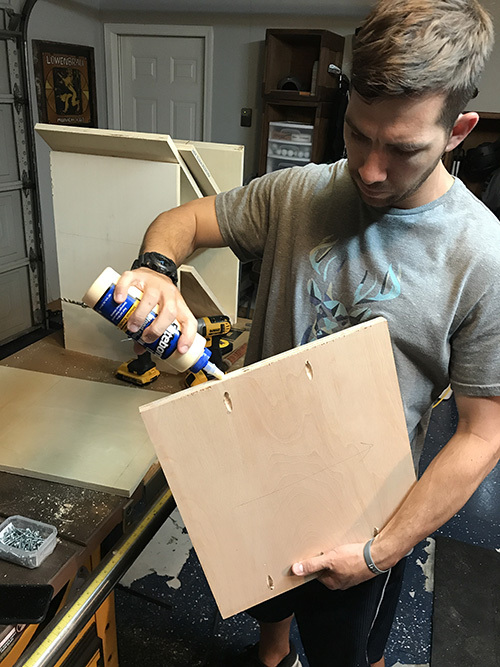 The cabinet doors are made with 1/2 inch oak plywood, and he used 4 select pine appearance boards (1 inch by 2 inch by 8 feet). 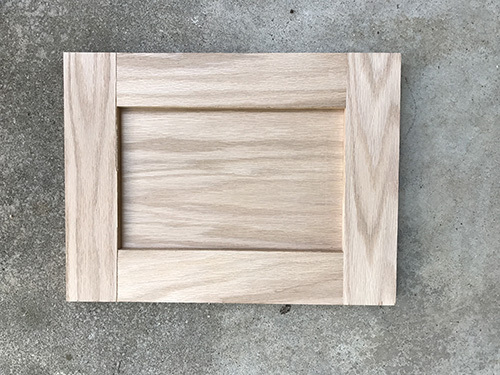 You need to add the trim so that you have a smooth, finished edge instead of seeing the layers of the plywood. The backing board is a 2x4 sheet of 1/4 inch luaun plywood. The first step was to make all of the cuts using a table saw. 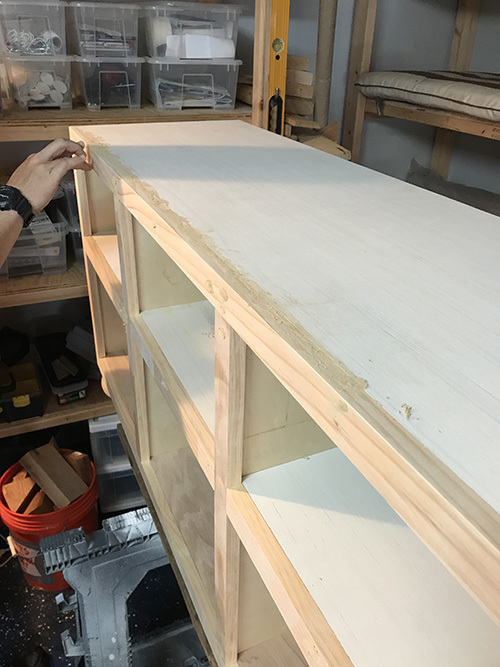 Once he had the pocket holes, he applied wood glue and used his impact driver to drive screws in and attach the shelves to the box. Slowly but surely, our media cabinet started to take shape. 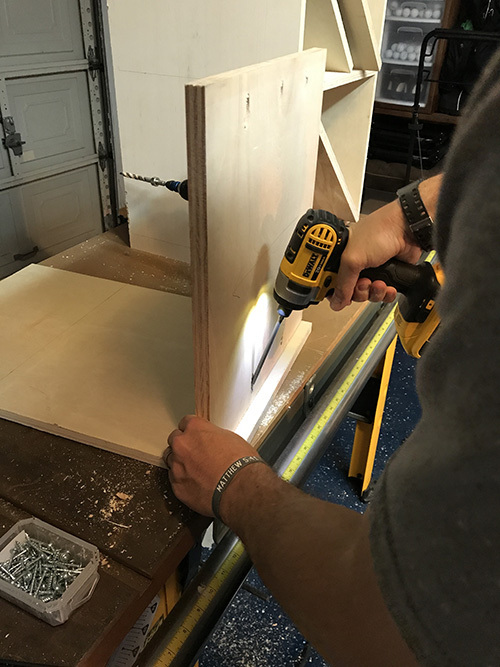 He used 1-inch L-brackets to connect the top piece to the rest of the box without having to have screw holes in the top of the board. Next step? Trim! He used his miter saw to cut the pine board to size and attached it to the box with wood glue and finishing nails. Once the trim was finished, he used wood filler to conceal the seams and nail holes. 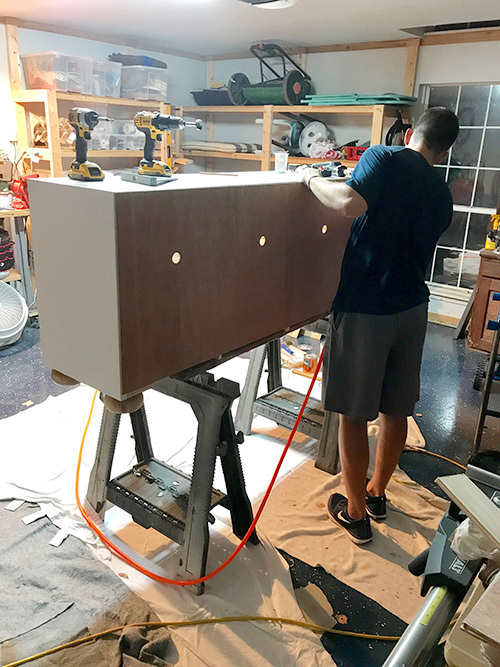 If you haven't worked with wood filler before, you simply plug the seams and holes, let it dry and then use sandpaper to smooth the surface before painting. It was amazing how much more polished the cabinet was once he finished the trim and added the bun feet. This is when I started getting very excited. I'm his biggest cheerleader during these projects, ha! Then it was time to make the cabinet doors. 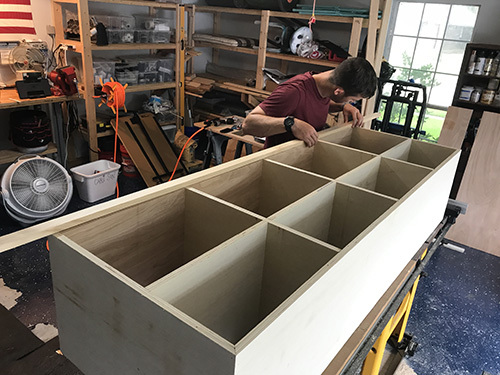 He measured the dimensions of each bottom opening in the cabinet for his cabinet faces and then ripped 2.5" strips of the same plywood to create the shaker details. Finally, it was time to paint! We really dislike painting, but he sucked it up and did a great job. He used a 4" foam roller to apply two coats of primer and one coat of white paint (left over from the trim and built-in cabinets in our den) to the box and one coat of semi gloss polyurethane to the doors. 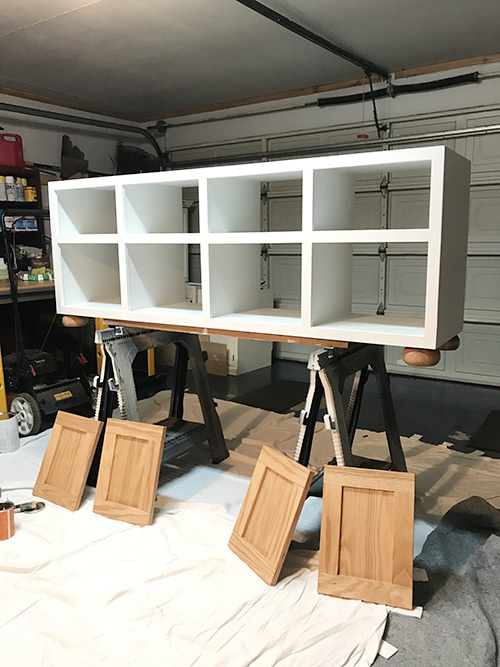 We also used the poly to stain the bun feet, and they ended up matching the doors really well even though they are different types of wood. 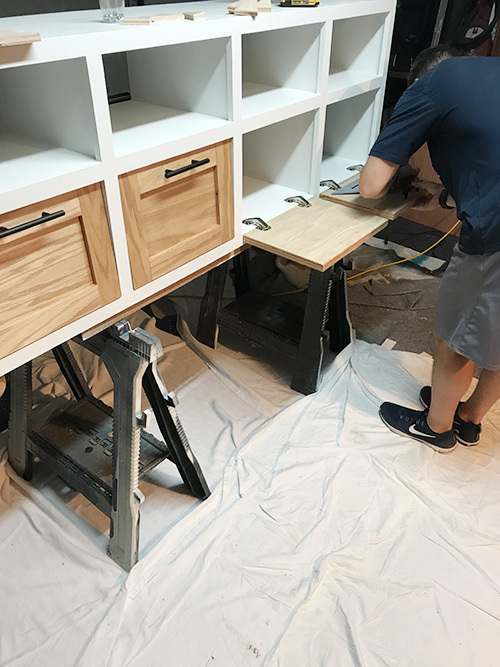 After attaching the cabinet pulls to each door, he started installing the cabinet doors. I wanted them to pull down because I thought that made more sense with the proportions of the doors. They are wider than they are tall, so I thought it would be weird for them swing open like normal doors. We used the same inset hinges that they used in that Weekender episode and they work really well. Side note: We will need to baby-proof this cabinet quickly because I can see the twins opening these doors over and over just like every other cabinet in our home! 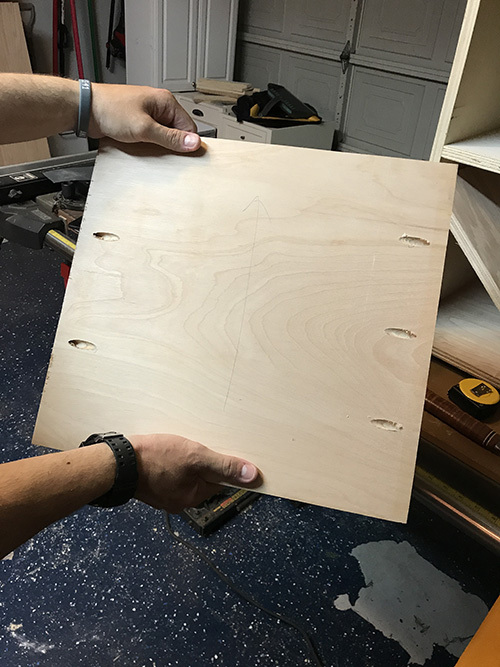 Lastly, he attached the backing board with finishing nails and used the hole saw bit for his drill to add a 1.25" hole in the back of each upper compartment to allow for the cords to pass through. Then we were finally ready to let our new cabinet shine in our favorite room in the house! I am so pleased with how all of the cabinet's finishes feel right at home in our calm, cozy den. 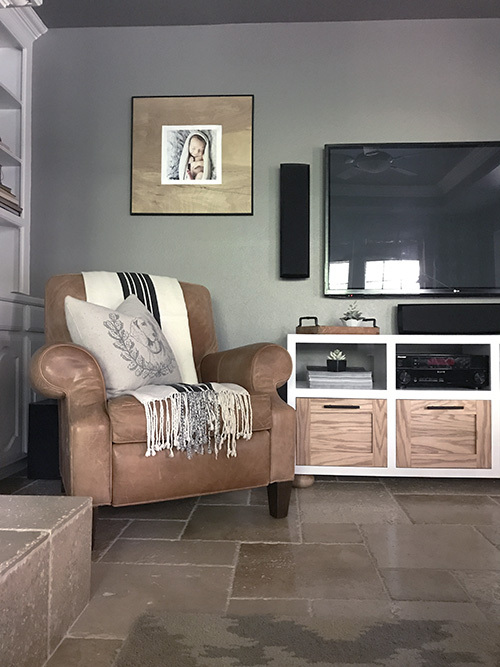 The warm of the wood doors really works with our accent chairs and travertine floors. 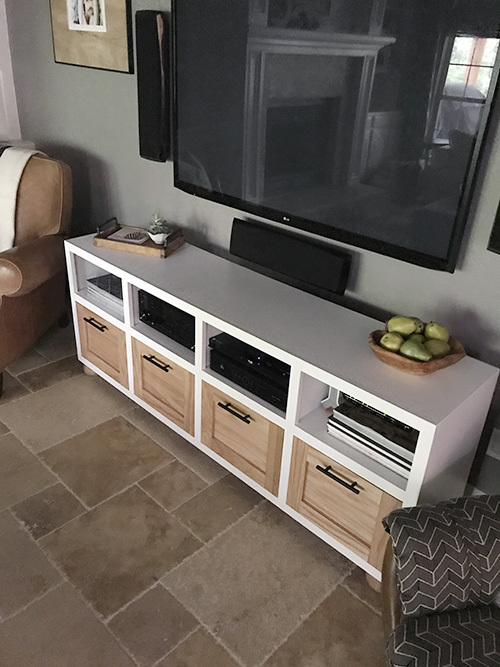 Our previous media cabinet was a medium grey color that blended in with the walls, but this new white cabinet really pops and brightens up that side of the room. Of course I had to put my feet up and test the view from my favorite spot on the sofa! This cabinet definitely took some time and effort, but we are so pleased with the result. 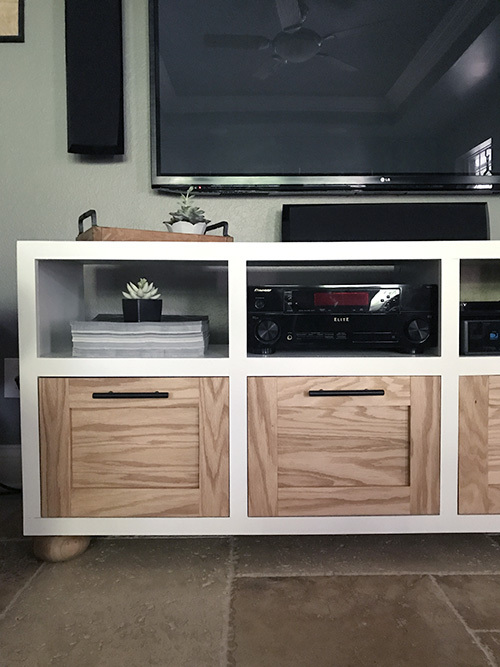 It's a huge upgrade over our old media cabinet, and it makes this room feel so much more custom and expensive. I'm so impressed with my husband's ever-growing repertoire of carpentry skills. I'm already scheming about what custom furniture he's going to build us next, and he has no idea! 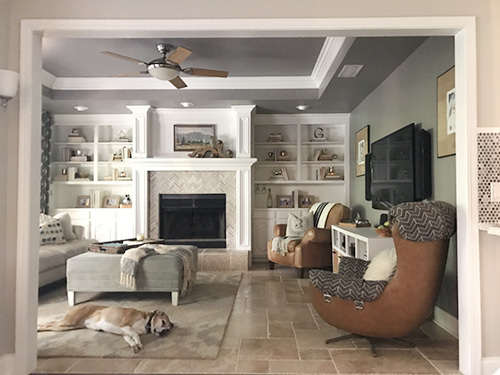 The Weekender is a Lowe's original series that shows you how five simple projects can transform a room in one weekend. It features super-talented home blogger Monica Mangin of East Coast Creative, and it's really a great resource. I love the online format because I can watch it whenever I want. They are shorter than regular home makeover TV shows, so it's easy to squeeze two or three episodes into my lunch break at work. The project ideas and tutorials are really smart and easy to follow. You can watch it on the Lowe's YouTube channel or Apple TV, Roku and Fire TV. (We're Apple TV people ourselves.) 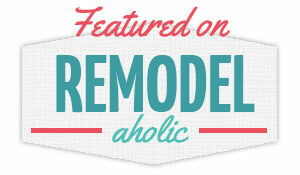 If you're an interior design junkie like me who lives for a good room makeover, you should check it out.